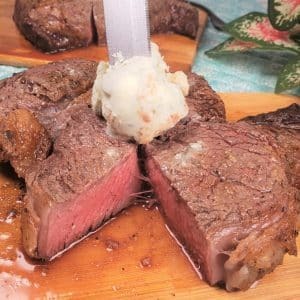 Make Air Fryer Rib Eye Steak with Blue Cheese Butter with my perfected method for a melt in your mouth perfectly cooked rare steak. Low Carb and Keto with a Savory Blue Cheese Butter Fat Bomb! I have perfected cooking steaks in the air fryer! Yep, cooked to perfection with my easy method every single time! There is nothing better than a nice steak cooked over a charcoal grill, right! The smoky taste and the outdoors is such a treat. However, if done right, cooking a steak using the stove top/oven method is pretty tasty. In addition, with my method and an air fryer you can achieve the most delicious steak of your life. My Air Fryer Rib Eye Steak with Blue Cheese Butter is going to be one of the best things to cross your lips! Start out with my most fabulous Blue Cheese Butter Steak Topper recipe. Whether you want a medium rare or just a medium cooked steak, my method will work. 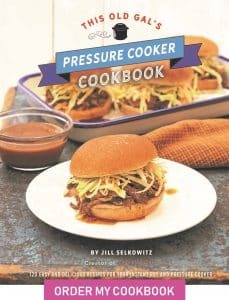 My recipe method is based on thickness of meat, not weight. If you have a 16 ounce steak or an 8 ounce steak, or anything in between, this method will work. 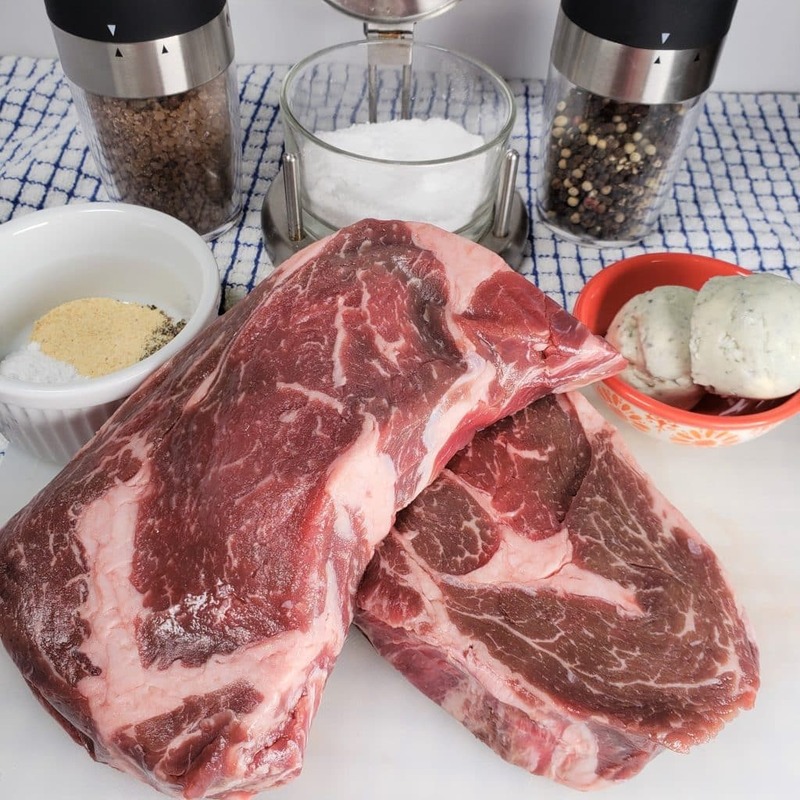 Ingredients to Perfect Air Fryer Rib Eye Steak. Kosher Salt or Smoked Salt for a charcoal cooked taste. For deals on steaks, check out Omaha Steaks and custom build a package. What is a Rib Eye Steak? It is the center portion of the rib section of the cow. A ribeye steak is typically served without a bone. Because of the marbling and fat, this particular cut is best cooked hot and fast. Besides roast prime rib, Delmonico steak was my favorite cut of steak. A Delmonico steak is a bone in rib eye steak, which got its name from a restaurant in New York. This apparently is the reason that many of my friends and acquaintances were not familiar with a Delmonico steak. My parents both were born and grew up in New York, so for me, it was what we called bone in rib eye steaks. Freshly ground pepper makes a nice crust on the steak. This electric pepper mill is so handy to use. Just turn it over and it automatically grinds the pepper. 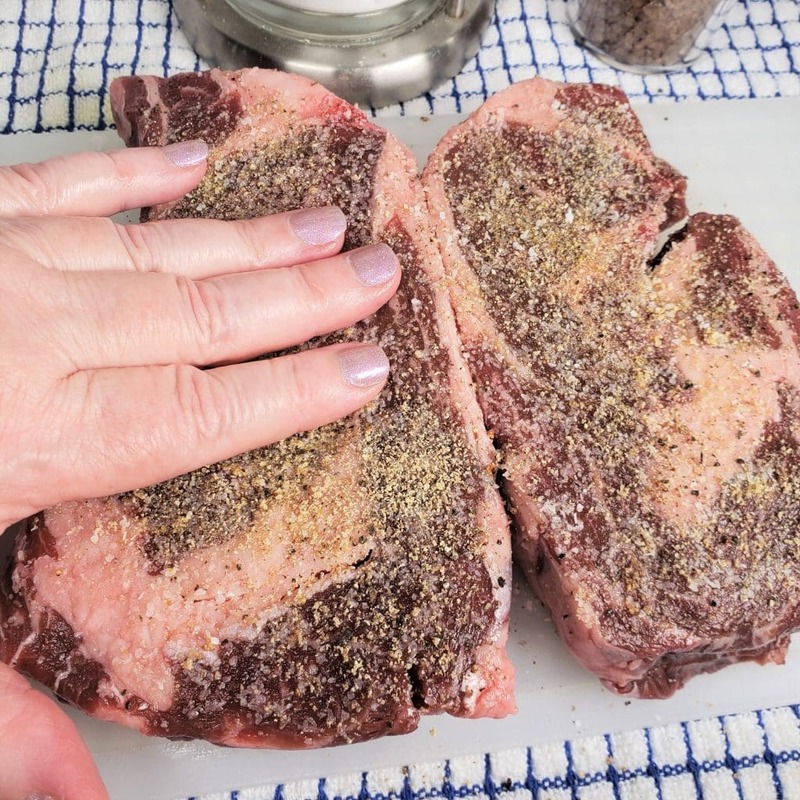 When cooking steaks in an air fryer, oven or on the grill, it is always best to let steaks sit out for at least 15 minutes to come to room temperature. For a bit of smokey taste, try using smoked salt. For optimal flavor and results, don’t trim the steaks before cooking. 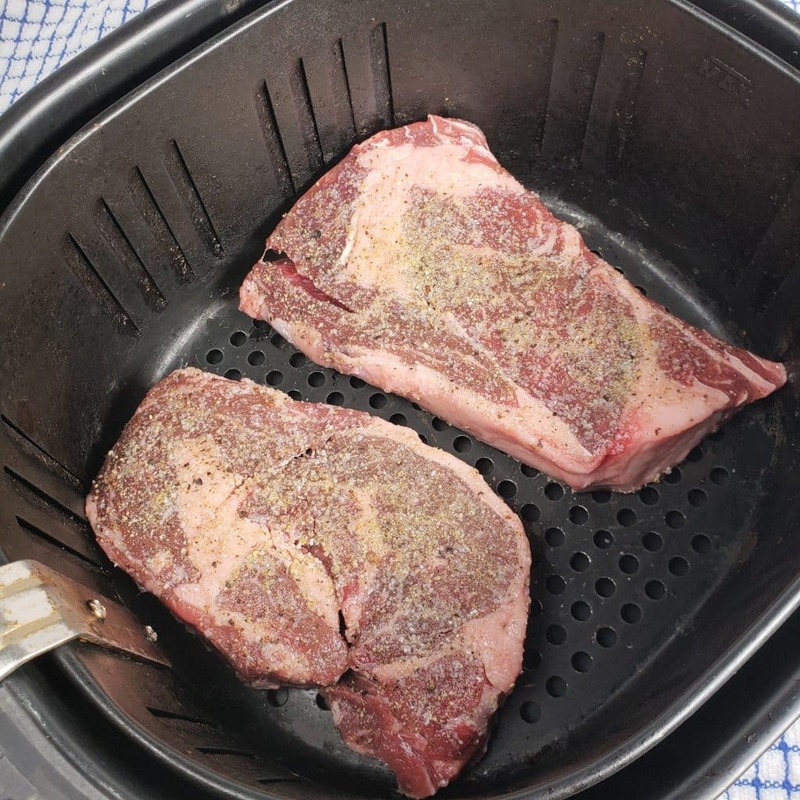 The fat and grizzle add tons of flavor while to the steaks as they are cooking in the air fryer. Press the seasonings into the rib eyes. Rib eye steaks need no steak sauce, as they are highly flavorful. 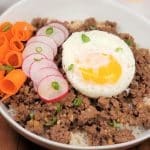 Other Beef Recipes to Enjoy. 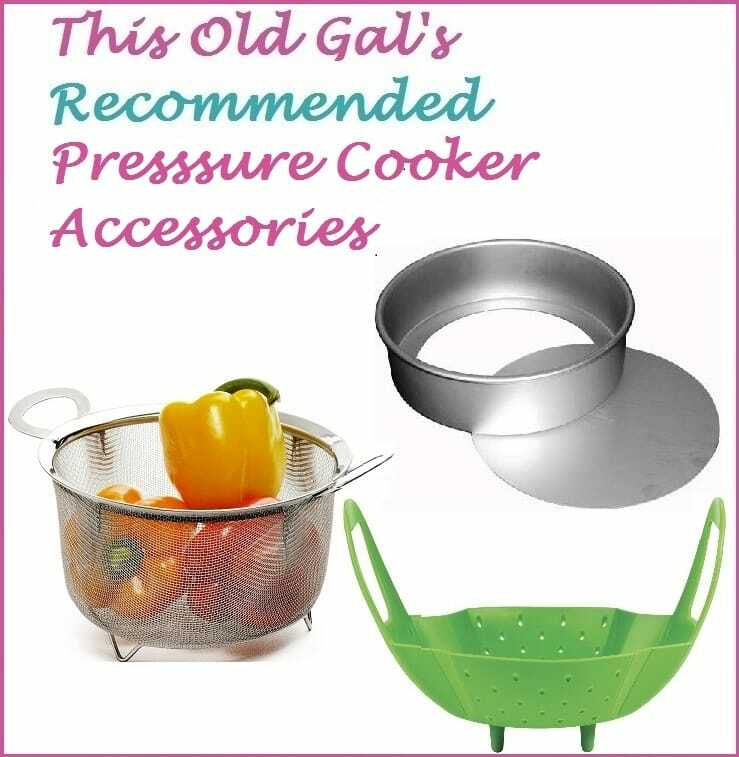 Whether you use a charcoal grill, stove top, oven, air fryer or Instant Pot DUO Plus, Mealthy MultiPot or Pressure Cooker, I’ve got you covered for the best cooking methods and results. 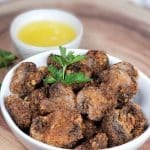 Why Preheat the Air Fryer? Rib eye steaks cook best at using a high heat and for a short time. 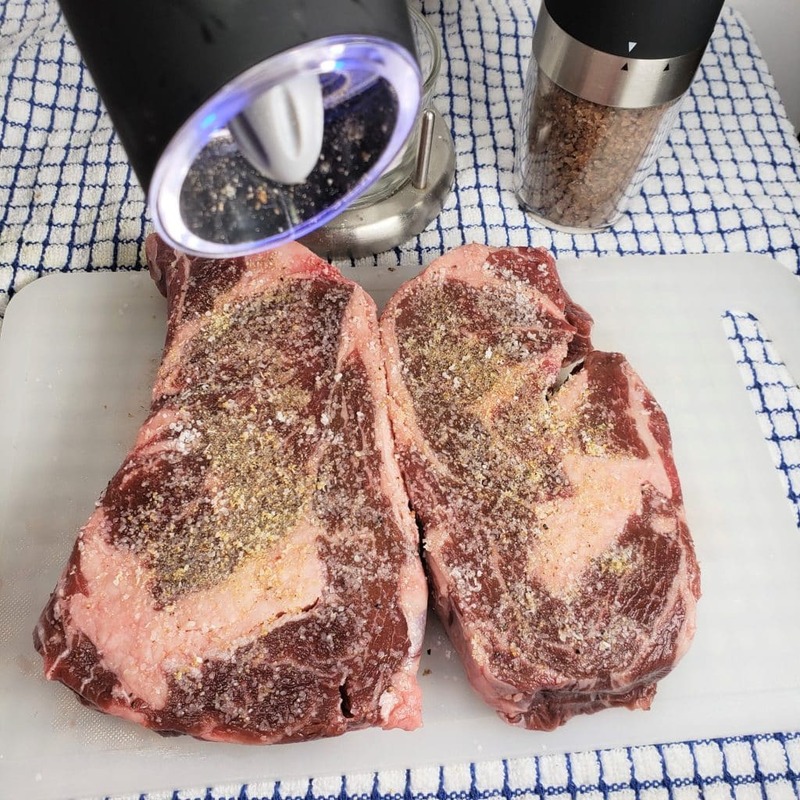 Preheating the air fryer means the steak will immediately sear in the juices and start cooking the steak evenly. The steak should be pink, top to bottom with just the surface area browned.. If you start with a cold air fryer, the steak begins cooking through to the middle and won’t form a nice crust on the outside. The entire inside of the steak won’t be an even color, like you see in the finished photos. A nice Caesar salad is a great way to start a steak dinner. What Side Dishes Go with Rib Eye Steak? The Blue Cheese Butter will melt and form sauce on the rib eye steak. I can’t wait for you to try my Air Fryer Rib Eye Steak with Blue Cheese Topper. A steak like this costs in excess of $60 at a good restaurant. Prepare Blue Cheese Butter according to directions. Remove rib eye steaks from refrigerator 15 minutes before starting recipe. Turn air fryer to 400 degrees (or the highest temp possible) and set time to 15 minutes. Air fryer needs to preheat at least 5 minutes before place in steaks. 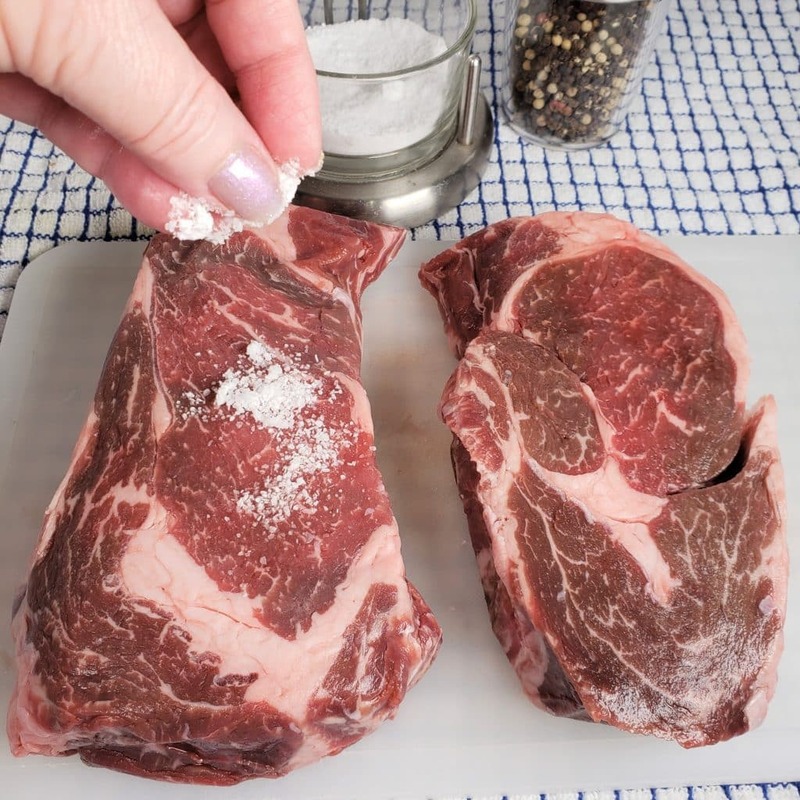 Coat both sides of steaks with salt, garlic powder and pepper. With your hand, press seasonings into steaks. Open air fryer and quickly place both steaks into basket and close. Cook at 400 degrees for 4 minutes and then quickly flip steaks over and cook for 3 minutes more. Turn off air fryer and do not open. Let sit for 1 minute for rare. For medium rare, let sit 2 minutes. For less rare 3 minutes, and so on. Top with Blue Cheese Butter. Cook time and method is based on thickness of steak, not weight. If the steak is too rare for your taste, preheat air fryer to 400 (or highest temp) degrees for 5 minutes and then place steak back into air fryer basket. Let cook one minute and then shut off unit and wait 1 minute before removing. It is important to make sure the air fryer is screaming hot before cooking the steaks, even needing to cook more. Always start with a screaming hot air fryer. 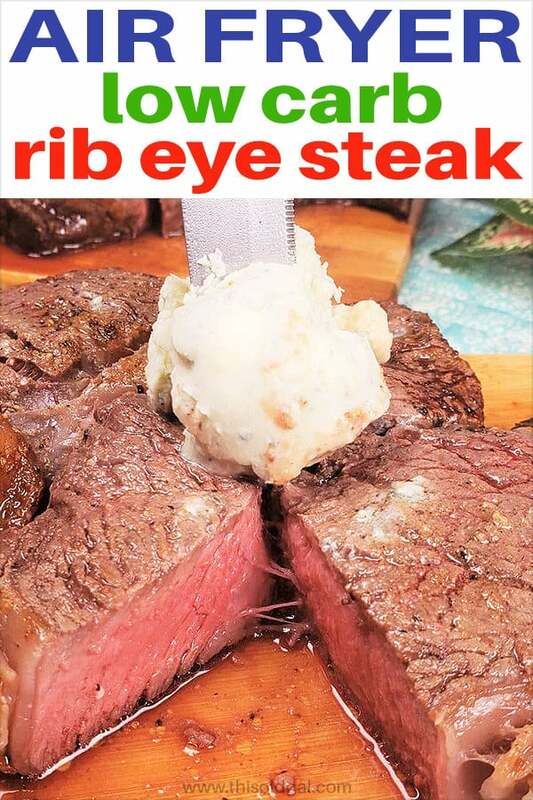 The photos in the recipe are 16 ounce steaks. 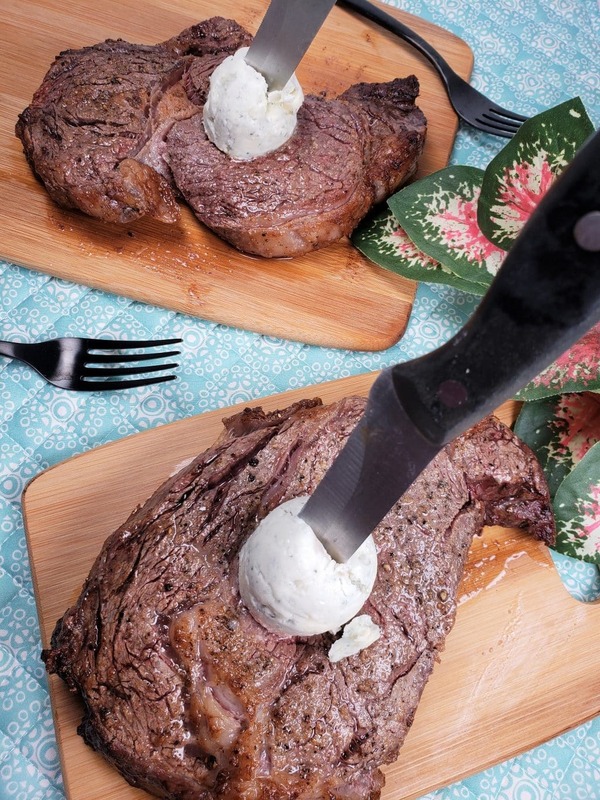 PIN this Air Fryer Rib Eye Steak with Blue Cheese Butter! This looks divinely tasty. One quick question though. Can I follow this same recipe with filet mignon that’s approximately the same height as a ribeye? 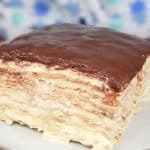 Thank you so much for this recipe!!!!!!! I made it tonight and it was soooooo good! Hi, Can you do this in a air fryer oven? I was looking for the temp to cook the steaks, or do I just use the steak pre-set? 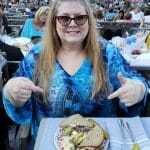 I love cooking steak in the air fryer! It always comes out juicy and tender…when using the BBQ is out of the question or I’m too busy to pay attention to the bbq, the steaks go right in the air fryer! Huge time saver! While this was good. 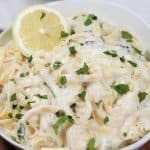 I am of the belief that this is an excellent recipe during the non grill winter months. I rate it a 7 out of ten. This is not an equal recipe (in the winter months) to searing in a cast iron pan then finish it off in the oven. Will it do it again. Yes – but reluctantly. I just made this along with the Blue Cheese Butter. Both were FABULOUS. The outside of the steak had a perfect crust. This will be a new family favorite. I may need a bigger air fryer.